Description: Gibson ES345 Electric Thinline Archtop guitar. 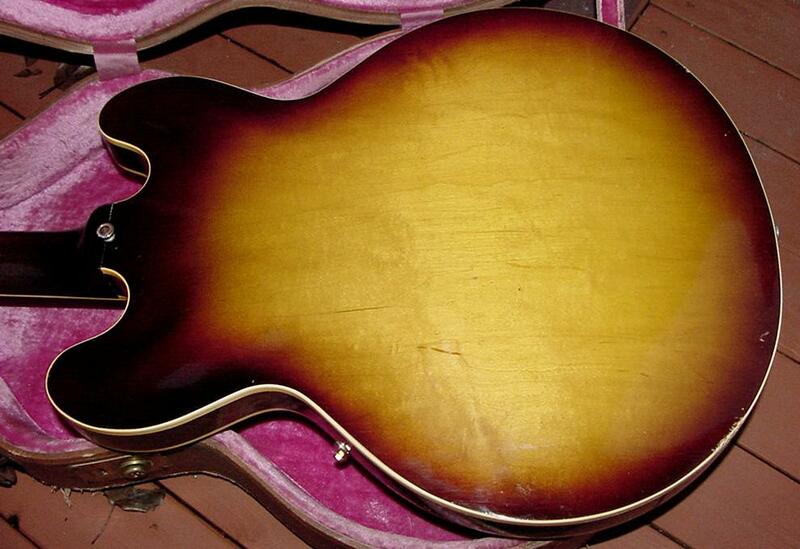 Case: Brown hardshell case with a pink lining was the top-end Gibson case from 1959 to 1961. Then in 1962 the case changed to a black outside with a yellow plush interior. Also available with a low-end aligator cardboard case. General Comments: The Gibson ES-345 guitar with its semi-hollowbody construction is a great guitar. The solid maple block down the center of the body minimizes feedback, but the hollow body wings gives good sustain, tone and weight. This model is most desirable with a stop tailpiece and a large neck size. Unfotunately the Varitone and optional Stereo wiring makes the Gibson ES-345 guitar less popular than its cousin the Gibson ES-335. Additionally the long pickguard (pre-1961) models are also nice. 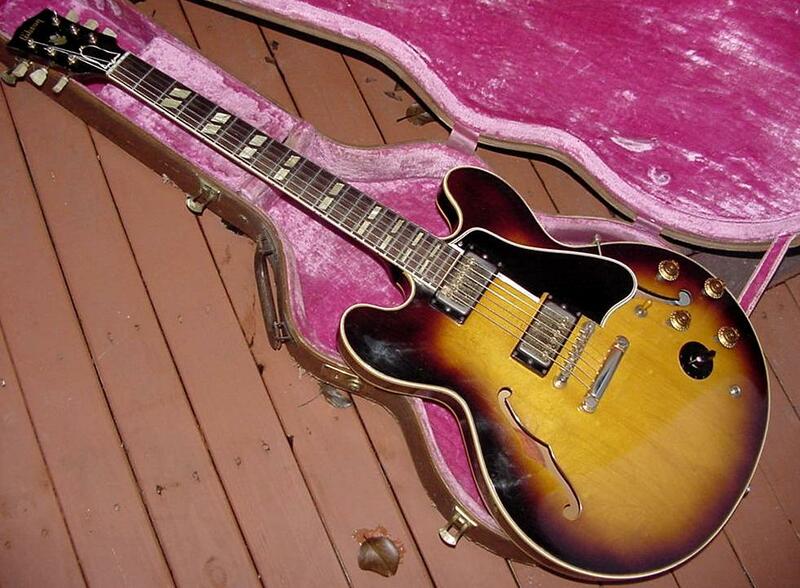 Bottom line, the 1959 models with stop tailpieces are considered the best. Alternatively I like the 1963 and 1964 models with a stop tailpiece, because the neck shape is nice. A Bigsby vibrato on the 1959 to 1964 models hurts the demand of this guitar. 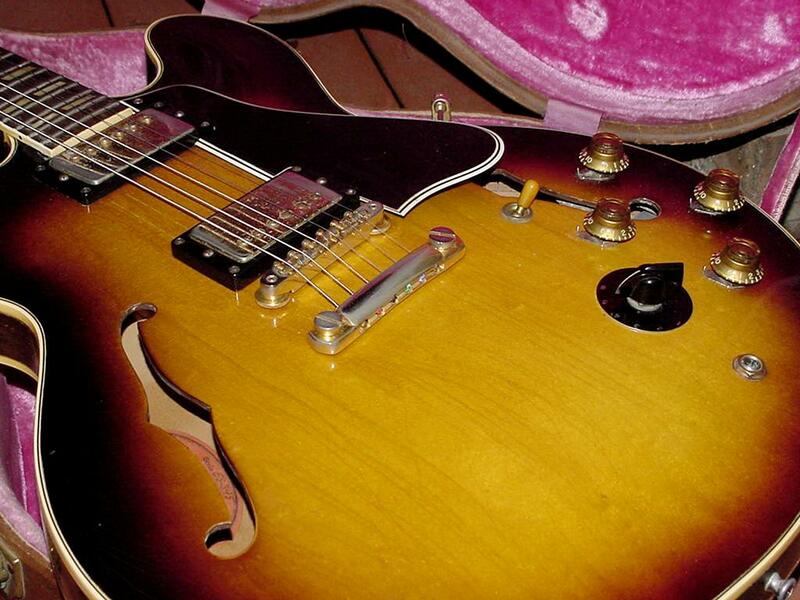 Also the 1960 to 1962 style "thin" neck also hurts demand (compared to the earlier "large neck" models, but this is a general fact of all Gibsons of this era). But the worse part of this model is the Varitone. Though it gives the guitar more tone colors, the two transformers located underneath the lead pickup add weight to the guitar. Also the different tone variants are frankly not that useful in my opinion. The Stereo part is pretty useless by today's standards too. Though the output jack can be easily changed to a mono type, this makes the two volume knobs act as a master volume. Hence turning the treble pickup volume to "one" while playing the neck pickup, will make the guitar silent. Though the Gibson ES-345 is a fancier version of the Gibson ES-335, it is far less collectible because the added gold hardware, binding, Varitone, Stereo, etc. just clutter the guitar. The simplicity and elegant ease of use of the ES-335 is why that model is more respected than the Gibson ES-345. Also the fact that many famous artists used the ES-335 instead of the ES-345 doesn't help the 345's fame either. Still the Gibson ES-345 is a very nice model with the basic sound and feel of the ES-335. If you need to figure out the exact year of your Gibson ES345, use the serial number. This is located inside the body, on an orangle label inside the body's bass-side "f" hole. 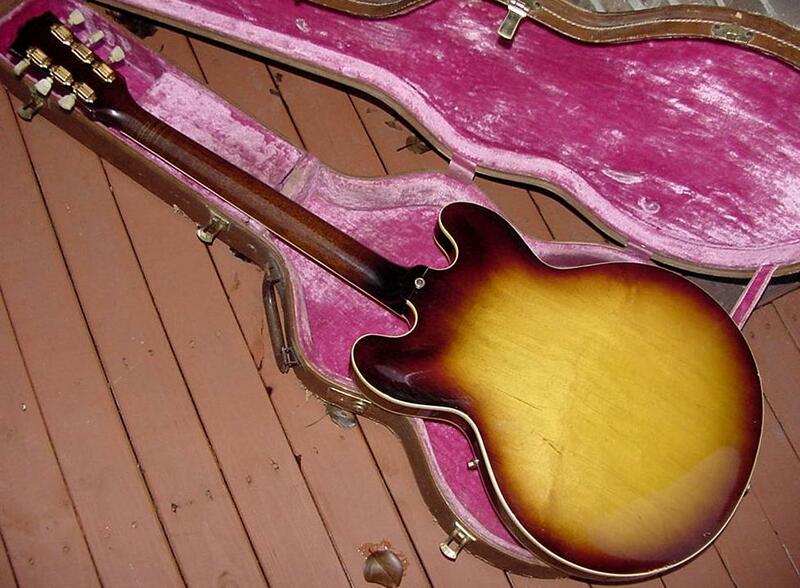 See the Gibson Serial Number Info web page for help determining the exact year. Thinbody, double cutaway, semi-hollow body with solid maple block down center, stereo electronics, 2 humbucking pickups, 2 volume and 2 tone knobs and a switch, Vari-tone rotary tone switch with black ring, tune-o-matic bridge, stop tailpiece or Bigsby vibrato, laminated beveled-edge pickguard that extends below the bridge, triple bound top, single bound back and rosewood fingerboard, double parallelagram fingerboard inlays, neck joins body at 19th fret, crown peghead inlay, gold plated parts, sunburst or natural finish. Shorter pickguard that does not extend past bridge pickup, gold ring around Vari-tone switch, cherry finish available. Trapeze tailpiece replaces stop tailpiece. Walnut finish available, tuners are Gibson Deluxe style. 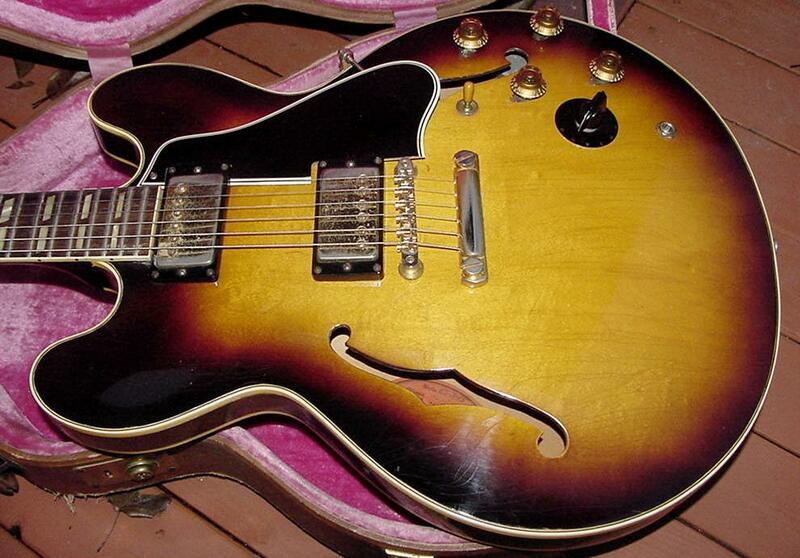 1959 sunburst Gibson ES-345 guitar with a stop tailpiece and "long" pickguard. the bridge cavity twin transformers for the Varitone system. 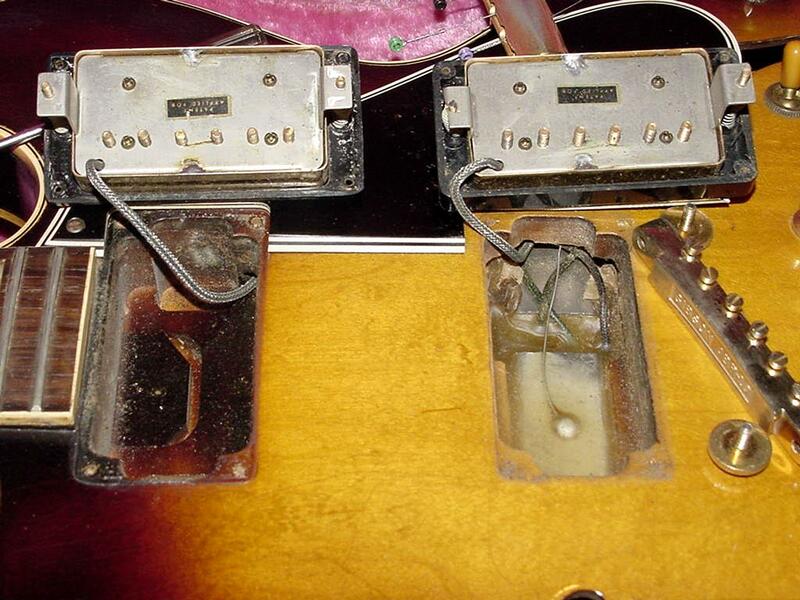 Gibson stopped using the wax around the Varitone transformers by 1961.